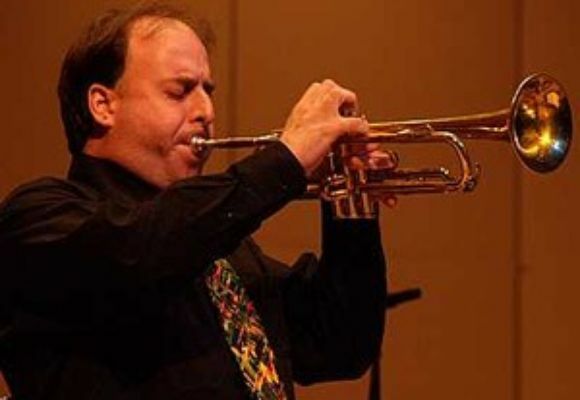 Gregory Lyle Gisbert (b. February 2, 1966, Mobile, Alabama) is an American jazz trumpeter and flugelhornist. Gisbert played drums with his father as a child. He moved with his family to Denver in 1971 and attended the Berklee College of Music in 1984-85, where he recorded alongside Cyrus Chestnut as part of Phil Wilson's Rainbow Band. Following this he worked with Buddy Rich (1985-86), Woody Herman's band under Frank Tiberi's direction (1987-89), John Fedchock and Maria Schneider, Gary Burton (1989), Lew Anderson (1989) and Toshiko Akiyoshi (1989 and subsequently). In the 1990s he played with Mingus Epitaph (1990-92), Frank Wess, Clark Terry, Mickey Tucker and Buck Clayton (1991), Danny D'Imperio (1991) Norman Simmons (1992), John Hicks (1992), Fedchock and Schneider again, and with the Convergence quintet. From 1994 to 1997 he worked with Joe Roccisano, and recorded with Chuck Bergeron, Loren Schoenberg and Ken Peplowski. He accompanied Carol Sloane and Susannah McCorkle in large ensembles in 1996. He has recorded three albums under his own name for Criss Cross Jazz. In recent years, Gisbert has become an active and highly respected jazz educator, teaching at festivals and conducting clinics across the United States. He also had two stints on the Jazz faculty at the University of Miami in the 2000's. He has also branched out in producing; bringing the up and coming conductor and composer, Chie Imiazumi, to the public's attention, acting as producer of her debut album, "Unfailing Kindness". Additionally, Gisbert is a founding member of Convergence, whose members include Paul Romaine on drums and Jon Gunther on saxophone. The highly regarded group is based out of Colorado and can be often heard playing at the Pec Too in west Denver.